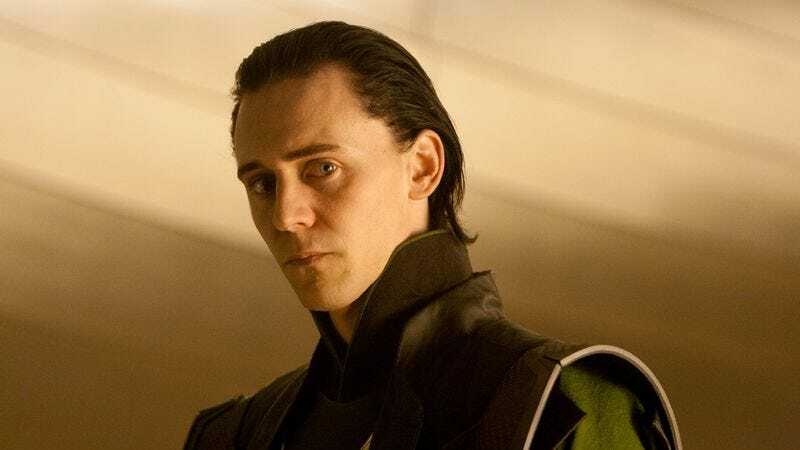 The fan: Tom Hiddleston may be best known to American audiences for his role as Loki, brother of Thor, in Marvel’s films Thor, The Avengers (where he played the film’s main villain), and the upcoming Thor: The Dark World. But his career in his native United Kingdom has been wide-ranging, full of plenty of work in classical theater and adventurous films. Those roles have included everything from Terence Davies’ The Deep Blue Sea to the Wallander series that put him on the radar of Thor director Kenneth Branagh. Hiddleston’s work has often intersected with the plays of William Shakespeare, however, and it’s an ambitious BBC miniseries—The Hollow Crown—that next brings him to American attention. Airing on PBS over the next three weekends in most markets, The Hollow Crown will place Hiddleston in the role of first Prince Hal and then King Henry V in adaptations of both parts of Henry IV and Henry V, in one of the few full versions of the Shakespearean history plays known as the Henriad ever mounted. The A.V. Club: Do you have a favorite Shakespeare play you haven’t been in? Tom Hiddleston: Immediately the one that comes to my head is Much Ado About Nothing. I think it’s the most beautiful, warm, redemptive, compassionate play that he ever wrote. I suppose the reason I say that is because it’s full of such deft, fine, subtle, brilliant comedy. I mean, really amazing bravura moments of setpiece, laugh-out-loud moments. When you get actors who have digested and studied and thought about and understood the verse and the characterizations, it feels as though it was written yesterday, or it sounds like it’s being made up on the spot. I’ve seen so many adaptations of it. I saw Joss Whedon’s film most recently. I grew up on Kenneth Branagh’s film. I’ve seen amazing productions on stage in London. I saw Simon Russell Beale play Benedick and it was hilarious, at the National Theatre with Zoë Wanamaker. David Tennant did it with Catherine Tate playing Beatrice. I’ve seen it set in ’30s Italy. I’ve seen it set in contemporary Los Angeles. I’ve seen it set 400 years ago. It never fails to delight. It just leaves people with a very, very happy feeling in their heart, I think. And I think the reason is that it’s about love. It’s about your last chance. You might have sworn off finding the right person and think, “Love’s not for me. Marriage isn’t for me. I will die a bachelor, or I will die a maid. None of your romance, none of your love poems.” It’s about these two old cynics who are like, “Nah, it’s not going to happen for me.” And it does. I think that’s just very redemptive and sweet. And there’s one extraordinary aspect of the play, which is that when Hero’s chastity is in doubt—it’s called into question because of the plot of Don John—an extraordinary thing happens, which is almost unique in all of Shakespeare, which is the man, Benedick, takes the side of the women in blind faith. So he says to Claudio and Don Pedro, I think, “What you’ve done is appalling. This is an act of brutality.” He doesn’t explicitly say that, but it’s an amazing thing where the leading male character takes the side of the women, and I think it’s, yet again, evidence of Shakespeare’s extraordinary compassion and understanding of human nature. AVC: It’s interesting, especially for that time, because it’s a play that’s seems almost as if it could end tragically and then it doesn’t. TH: Yeah.Cymbeline is quite like that, which I was in about six years ago. It’s one of his very last plays and it’s quite busy. It’s almost like a greatest hits: There are star-crossed lovers and the girl dresses up as a man and there’s long lost brothers… [Laughs.] and a very Iago-like villain and kings and queens and princes and a song and mistaken identity. It feels like he’s put all of his greatest plot devices in the same thing. You’ve got Romeo And Juliet, you’ve got As You Like It, Othello and sexual jealousy, and war in it. He’s kind of pulling all his strands into one big cake of a play. It looks—toward the end of the play, kind of act-five area—it’s going to end badly, then on a dime it turns, there are all these amazing revelations, and you realize the characters you thought were dead are still alive. Fathers and sons who were separated and forgotten are suddenly reunited, and it’s something that’s narratively very neat. But also, I think, as an audience, following a story, being swept along by the sweep, the arc of a narrative, it’s always delightful when there’s a twist. It could be a kind of twist that makes you punch the air. It could be a twist that melts your heart. I think we’re still delighted by that. Like in The Bourne Ultimatum, you think it’s the end of Jason Bourne, and then he swims away and you think “Oh! You’re still alive!” We love a good narrative twist. AVC: In Much Ado there are three parts for men of different ages. Of those parts, which would you most like to play? TH: I would love to play Benedick. Absolutely. It’s very much on my wish list. He’s so funny. He’s such an old dog. And there’s such fine wit in the way he speaks. And he’s a warrior, too. I think if you embrace the idea of a classical career, in the old sense of the word “career,” you have a good stab at all the big ones, at the moment I’m playing a lot of soldiers. I’ve played Posthumus in Cymbeline, Cassio in Othello, Prince Hal, Henry V, I’m about to play Coriolanus. They’re all soldiers. They’re all warriors. And what’s nice about Benedick is he is a warrior, but he’s a warrior who falls in love. So I feel it’s sort of a logical progression. There are some other princes I haven’t played yet, too. AVC: Do you have favorite moments from the play that you think of as particularly humorous or really funny scenes? TH: I love the scene when the three guys trick Benedick into thinking that Beatrice is in love with him. It’s just like pure gold. I’ve never seen that scene not be funny. When they are staging a conversation, which they know Benedick will overhear, and it just hits him like a train. He has that beautiful line, “Love me? [Beat.] Why?” [Laughs.] Because the story’s been set up that they hate each other until that point. I love that scene. AVC: So much of Shakespeare is about analyzing the verse, about understanding the subtleties of the language. When you sit down as an actor and start looking at one of his plays, how do you approach that question? It makes me want to pick up a sword and fight for him. And I don’t really know how I process the lines, which apart from the fact that it lifts me up and into it in a way. It’s like, “You’re either in it to win it, or you’re out. I’m giving you a chance to leave, now.” In terms of my relationship with the verse, it’s very hard to articulate quite how I work with it apart from that I get very excited about it and it draws me toward it. The rhythm of it, the language of it, and I think he’s such an instinctively compassionate and intelligent writer that quite often the language of the character tells you everything you need to know about what that character is thinking and feeling at that moment. Those images are just like, “It’s all well and good in peacetime [to] be humble, be still, be gentle, but when it’s wartime unleash the beast.” I mean, Survivor wrote a rock song about it, “Eye Of The Tiger.” It’s the same image. It’s the same stuff. Al Pacino tried to do it better in Any Given Sunday, but it’s the best locker-room speech in the history of dramatic literature. So yeah, that’s how I approach the verses. I find it amazingly inspiring and contemporary. AVC: Prince Hal is one of the most famous roles in Shakespeare. What were you surprised by when you sat down to pull apart this role and start thinking about it? I couldn’t get inside a sort of disingenuous Hal, in a way. Some of it is there. There’s a sort of bookend in the pub scene where Hal and Falstaff are playing a game, playing dress-up, and they’re staging a scene between Henry IV and Hal, and at the very end Falstaff gets very sentimental and says, “When you’re king, don’t get rid of me. Keep me close, even though I am an old, fat drunk, because I’m your friend and I love you and don’t banish me.” I think when Hal says, “I do, I will,” I think there’s a sort of admission of inevitability and regret that takes them both by surprise. But, of course, like life, best-laid plans are often refuted. Hal couldn’t possibly predict that at the end of [Henry IV] Part 2 Falstaff would personally interrupt his coronation and make him look like an idiot. I think Hal knows that he’s going to have to grow up one day, but he doesn’t know that he’s going to have to be so ruthless. I think it’s a really classical arc of a young man, a young man in any time, in any country, in any place. Essentially testing his limits, pushing the envelope, stretching his boundaries, trying different things on for size and then eventually deciding to take responsibility and become an adult. And the adult he decides to become is King Henry V.